How Do People React to Robocalls? Robocalls lessen people’s trust in phone-based communication. In response to robocalls, people block phone numbers, implement screening tools, and sign up for the National Do Not Call Registry. Despite anti-robocall legislation, scammers and spammers find new ways to make robocalls. In response, experts are designing new technology to validate phone numbers and restore trust in phone communication. In the first installment of our series on robocalls, we discovered that more than half of people receive a robocall at least once per day. Robocalls are automated calls conducted for marketing or scamming purposes, and they’re a major issue in the United States due to how easy and inexpensive it is to make them. Authorities also struggle to identify robocallers, making punishing them difficult. For our second report, we surveyed 687 phone owners who receive robocalls to analyze their reactions to robocalls. We learned that robocalls erode people’s trust in phone communication. This impacts phone-based communication with both peers and businesses. To combat robocalls, people take steps such as implementing screening tools and blocking phone numbers. The majority of people believe robocalls should be banned completely but don’t realize that past legislation has tried, and failed, to do so. Businesses can use this report to learn best practices for contacting customers over the phone in the age of robocalls. More than two-thirds of people (67%) are unlikely to pick up a phone call from a number they do not recognize, creating challenges for legitimate phone-based businesses. People are most likely to block phone numbers (60%) to combat robocalls. Others take extra steps to prevent robocallers: 43% have signed up for the National Do Not Call Registry, and 25% have implemented a tool for screening robocalls. 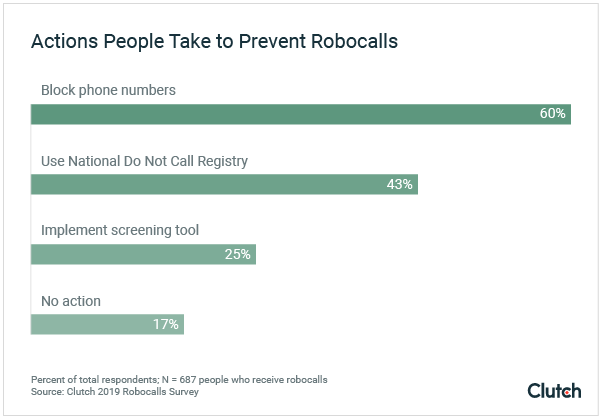 Approximately half of people who added themselves to the National Do Not Call Registry (49%) say that the number of robocalls they receive has remained the same, while 19% say the number of calls has increased. 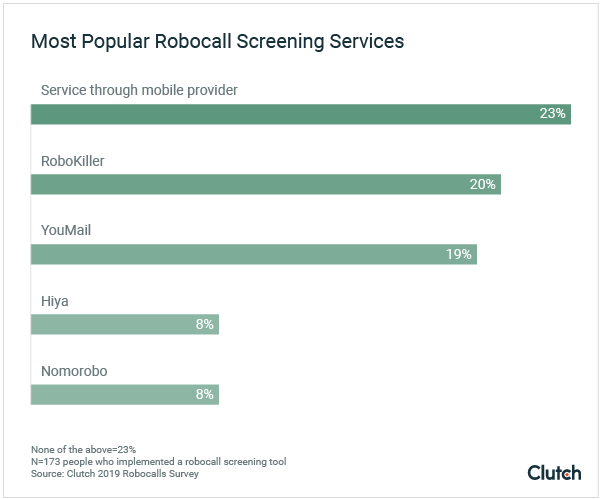 Among people who use a tool to screen robocalls, the largest percentage (23%) signed up for a service through their mobile provider, such as Sprint or Verizon. 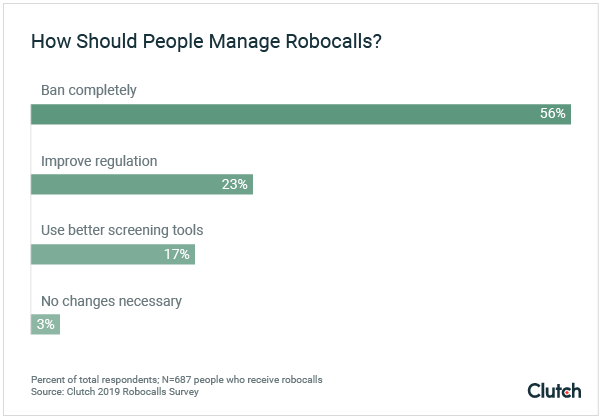 The majority of people (56%) believe that robocalls should be banned completely, while 23% say robocalls should be better regulated. Most people are wary to pick up calls from numbers they do not recognize. We found that 67% of people are unlikely to pick up such calls. As people become savvier to the sales or scams robocallers peddle, they begin to distrust all phone calls from numbers they don’t recognize. This distrust harms businesses that may need to call people for valid reasons. Dionisio says that to combat this atmosphere, businesses must provide exceptional customer service over the phone. “Voice interaction is essential for the customer experience, and there’s really no replacement for that." Some businesses that used to conduct outreach over the phone are now seeking alternate contact methods due to the prevalence of robocalls. Buy Life Insurance for Burial, an agency for final expense life insurance, began conducting more face-to-face outreach instead of exclusively finding prospects over the phone. This personal touch stands in stark contrast to the mechanical voices of most robocalls. As the number of robocalls continues to grow, businesses will need to work hard to overcome people’s inherent distrust of unknown phone numbers. The majority of people try to reduce the number of robocalls they receive. People most commonly block phone numbers (60%), but many have also signed up for the National Do Not Call Registry (43%) or implemented a tool for screening robocalls (25%). Only 17% have not taken any action against robocalls. Individually blocking phone numbers offers little protection against robocalls, as robocallers can simply call from new numbers. Actions such as signing up for the National Do Not Call Registry or adopting screening tools offer more sweeping protection but vary in their effectiveness. When the government first implemented the National Do Not Call Registry in 2003, it was hailed as an innovative program to fight the invasion of spam calls. The registry has failed to protect consumers, though. 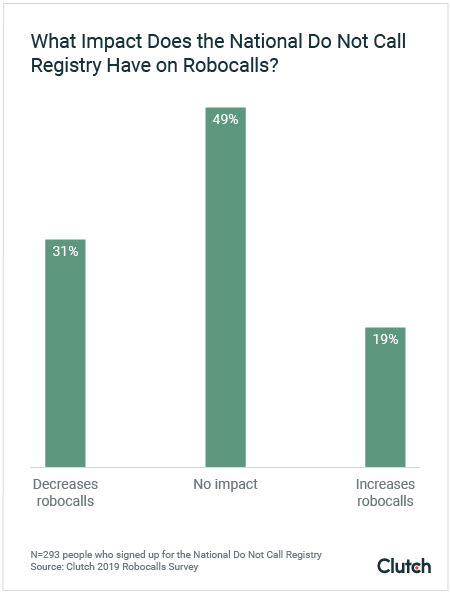 We found that approximately half of people who signed up for the National Do Not Call Registry (49%) say the number of robocalls they receive remains the same. In fact, nearly 1 in 5 people (19%) say that the number of robocalls has increased. Why doesn’t the National Do Not Call Registry work? It failed to keep up with changes in telemarketing and robocall technology. At first, the registry was a success. In the first three months of its existence, 50 million people signed up. But in the early 2000s, lawmakers mainly worried about human telemarketers pestering people, not robocalls. With time, automated robocalls grew increasingly popular, thanks to advancements in voice-over-internet-protocol (VoIP), or technology that allows phone calls over the internet. With automated robocalls, scammers can set the technology to call a list of numbers without looking up if the number is on the National Do Not Call Registry. Another technique called spoofing allows robocallers to mask their phone numbers by tricking caller ID into displaying a different number. This makes punishing the robocallers more difficult and causes robocallers to be even less invested in respecting the registry. Spoofing is common, with 44% of people receiving a robocall from a number with the same area code as their personal phone number daily. In the beginning, the National Do Not Call Registry seemed to promise solid protection from unwanted phone calls. Its effectiveness did not stand the test of time, however. For some people, a screening tool offers much-needed relief from the endless ring of robocalls. These tools detect incoming robocalls and take action, such as blocking them or even answering them with a sassy response. We found that the majority of people who use a screening tool either use one not listed on our survey (23%) or sign up for a service through their mobile provider (23%). Alex Quilici is the CEO of YouMail, an app offering robocall screening features. He says that there are 500+ screening tools out there, giving context to the 23% of respondents using a tool not listed in Clutch’s survey. Meanwhile, another 23% of respondents use their mobile provider’s service to screen robocalls. Until recently, the law required mobile providers to connect all calls, including spam ones. In November 2017, though, the Federal Communications Commission (FCC) allowed mobile providers to block known spam calls. Now, a number of mobile providers offer robocall protection, such as AT&T’s Call Protect service. There are a variety of third-party apps that screen robocalls. Among these tools, RoboKiller (20%) and YouMail (19%) are two of the most popular. Most of these apps work by scanning a database of known spam calls and blocking incoming calls from those numbers. RoboKiller goes even further – the app’s “Answer Bots” can answer the robocalls and confuse them with nonsense. Quilici describes his app, YouMail, as something similar to virus protection. Screening tools can potentially decrease the number of robocalls an individual receives or accidentally answers. Businesses that rely on human or virtual assistants also have an advantage when it comes to screening robocalls. “Businesses should employ qualified in-house or outsourced receptionists that screen all incoming calls properly and ensure proper call routing, communication and productivity throughout a company,” said Martin Senn, CEO of Davinci Virtual Office Solutions. Companies risk their employees’ productivity if robocalls remain a constant distraction. Individuals and businesses have multiple choices to protect themselves from robocalls, but no tool is perfect. To many, robocalls remain a persistent issue that should be stopped. The majority of people (56%) say they’d like robocalls to be banned completely. As robocalls increasingly pester people, many assume that little has been done to stop them. In fact, legislators have attempted to combat robocallers. Most regulations aren’t working, though. Given that robocalls persist despite these laws, it seems robocallers aren’t deterred by them. More recent government action seeks to implement technology that will actively validate legitimate phone calls, instead of just banning illegitimate ones. STIR/SHAKEN is a potential technological solution to the robocall invasion. The technology is a combination of the “Secure Telephone Identity Revisited” (STIR) standard and the “Signature-based Handling of Asserted information using toKENs” (SHAKEN) standard. Together, these two standards promise to verify inbound callers and restore trust in caller IDs. With STIR/SHAKEN, legitimate calls would contain certificates distributed by a policy administrator. If a phone call contains a certificate, STIR/SHAKEN indicates that the phone number is legitimate, verifying that it is indeed coming from the number displayed on caller ID. This validation could be displayed with a check mark on the caller ID, similar to how social media sites verify accounts. This idea already works on a large scale: It’s similar to how the internet uses SSL certificates to validate websites. In the future, STIR/SHAKEN may even allow more in-depth spam-blocking, potentially stopping robocalls entirely. Some businesses are excited by the prospect of STIR/SHAKEN. VirtualPBX, a VoIP communications service provider, helps businesses select phone numbers. VirtualPBX often deals with clients who are concerned about the legitimacy of the phone number they select. In late 2018, the FCC pushed major mobile providers to be ready to adopt STIR/SHAKEN. Of all the major providers, only T-Mobile claimed to be ready to implement STIR/SHAKEN as of November 2018. The FCC hopes to implement STIR/SHAKEN across all mobile providers in 2019. Overall, the future of robocall prevention requires an active approach, such as STIR/SHAKEN. Passive approaches focused on punishing robocallers – who are difficult to find and not deterred by the law – have not worked well. Robocalls pester people with unwanted marketing pitches or scams, decreasing trust in phone communication overall. The majority of people are unlikely to pick up a call from a phone number they do not recognize. When it comes to fighting robocalls, most people block phone numbers, though the effectiveness of this approach is limited. Others sign up for the National Do Not Call Registry and implement screening tools, either from third-party services or through their mobile provider. Businesses may seek help from in-house or virtual assistants. More than half of people want robocalls banned, though extensive legislation has already banned many definitions of robocalls. Future legislation aims to thwart robocalls actively by validating legitimate phone calls. Clutch surveyed 687 respondents who own and regularly use a mobile or landline phone and who receive robocalls. Most respondents use a mobile phone (83%), while 17% use a landline phone. More than half of the respondents (55%) are female, while 45% are male. The survey includes the following age groups: 18 to 24 (14%), 25 to 34 (24%), 35 to 44 (25%), 45 to 54 (13%), 55 to 64 (12%), and 65+ (12%). Most respondents are located in the South (36%), 22% are located in the Midwest, 21% in the West, and 17% in the Northeast.